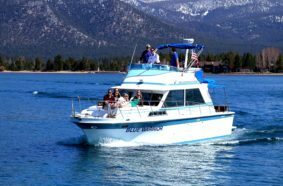 Charter out the “Blue Warrior” to cruise breathtaking Lake Tahoe. Enjoy the entire boat for just your private party. Seating up to 20 passengers. These tours are customized to fit your group’s needs, allowing you to explore historic sites, swim in crystal blue water, watch the sunset, or just enjoy a relaxing time with your family and friends.The Blue Warrior is perfect for Bachlorette parties, family reunions, girl’s weekends, weddings, corporate corporate get togethers, or any small group.